Varutra's Security Assessment services helps organizations reduce exposure to risk, protect data assets and minimize the impact of security related events on business activity. Our services are highly customizable to suite client's needs as per the cloud services and deployment model they have adopted for the business. In cloud computing, resources such as computing power, storage, network and software are abstracted and provided as services on the Internet in a remotely accessible fashion. Categories of cloud computing are Software as a Service (SaaS), Platform as a Service (PaaS) and Infrastructure as a Service (IaaS). Also the cloud can be deployed as Public, Private, Hybrid or Community. Cloud computing has its own challenges when it comes to Information Security. It is of utmost importance to protect the critical data and systems in the cloud. 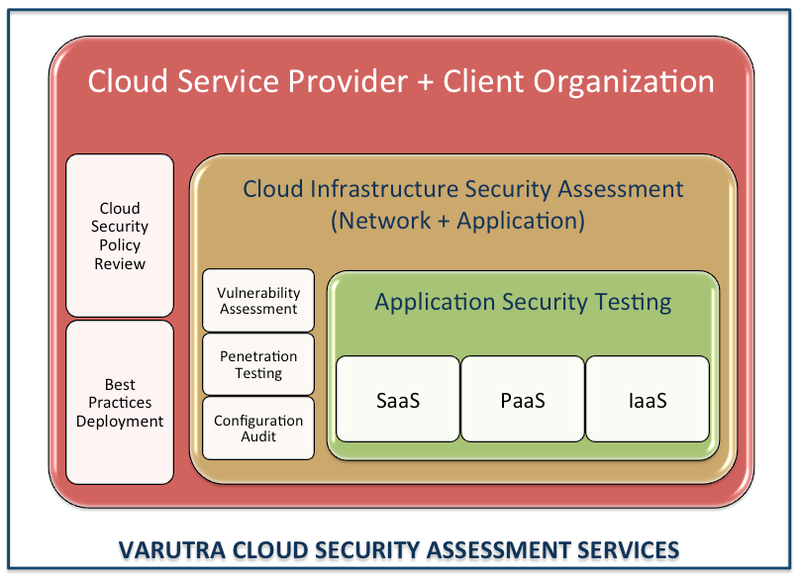 Varutra offers Cloud Vulnerability Assessment, Cloud Penetration Testing services for the information systems and applications running in the cloud. We also offer a unique Cloud Security Audit, which is a comprehensive analysis and review of the security of the Information Systems from the perspective of working of the internal controls and policies. This analysis is essential to determine the security and effectiveness of the controls, which are in place. Wikibooks defines "Reverse Engineering" as the process of discovering the technological principles of a mechanical application through analysis of its structure, function and operation. That involves sometimes taking something apart and analyzing its workings in detail, usually with the intention to construct a new device or program that does the same thing without actually copying anything from the original. Varutra offers the reverse engineering service where target software or product is reverse engineered to extract its design and implementation details, understand its internal interactions with different software components. The entire process is carried out to uncover security issues and vulnerabilities, to exploit its weaknesses and to strengthen its defenses. Varutra offers a highly strategic and customized solution to test a product or software with various techniques and our expertise in reverse engineering. In Black Box Testing of a product / software, Varutra follows a completely different approach than traditional vulnerability testing. Varutra consultants will fuzz the target software to finding out critical vulnerabilities usually not identified in traditional testing. In addition to find out known security issues, a zero day security testing approach is followed to analyze unknown vulnerabilities in the software product. Binary audit is essentially carried out on software product binaries, executable, dll's, libraries, etc. Fuzzing: Fuzz Testing or Fuzzing is a software testing technique used to discover coding errors and security loopholes in software, operating systems or networks by inputting massive amounts of random data, called fuzz, to the system in an attempt to make it crash, generates errors. Various techniques including mutation based fuzzing and generation based fuzzing are applied. Varutra uses a custom approach tailored to each client that combines fuzzing and reverse engineering with black box testing. Varutra’s technical configuration audit process is highly customized to suit the organization’s network infrastructure.The audit process broadly consists of auditing the perimeter devices, networkdevices such as firewall, routers, switches, load balancers, IPS, IDS and Server Systems such as Domain Controllers, File Servers, FTP Servers, Email Servers, Proxy Servers, Antivirus Servers and Databases comprising network architecture. Wireless Networks are an integral part of organizations network infrastructure and has the exposure to internal/external threats. Varutra’s wireless security audit methodology is a result of research, proven techniques, advance testing tools and rich experience of our security experts in this area to ensures the maximum coverage over all possible threats from various dimensions. Several wireless deployments are accessible beyond the acceptable physical premises protecting the infrastructure,which presents unique threats. Attackers can target wireless access points with pre-defined and planned attack strategy. Wireless security assessment will help in detecting, locating and mitigating the risks posed by the current implementation of wireless network technology by taking a very pragmatic and systematic approach to assess & report the current security posture of wireless networks.